The UK government will sell off 56 more defence sites by 2040, the defence secretary has told MPs. Sir Michael Fallon said the sale of the sites - part of a review of Ministry of Defence land - was in addition to the sale of 35 MoD sites that had previously been announced. Unions called the plans "brutal" and promised to fight the closures. But Sir Michael said it would deliver better value for money and release enough land to build 55,000 homes. It is estimated that about £140m will be saved over the next decade by selling off the sites, which Sir Michael said would be reinvested in creating "areas of military expertise" in locations across the country. More than 32,000 acres of defence land will be released, including 10 surplus airfields and five golf courses. "By putting money where it is needed, we will provide better facilities to train our armed forces and deliver more stability for military families," he said, adding that the moves are part of a package of more than £4bn of investment in the services. The majority of sites will be in England, including parts of Catterick Garrison, North Yorkshire - the Army's largest garrison - the Prince William of Gloucester Barracks, near Grantham, and Imphal Barracks in York. 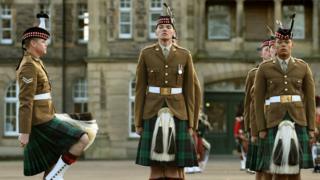 A further eight sites in Scotland will close, including the Redford Cavlary and Infantry Baracks in Edinburgh, and Fort George, near Ardersier. Then Wales and Northern Ireland will each have three bases closed, including Brecon Barracks. New sites and bases will be moved to locations which are selected based on employment opportunities in the community, enabling military families to buy their own homes and reducing disruption to children's education, Sir Michael said. These include new regional hubs for light infantry battalions in London, Edinburgh, Lisburn, St Athan, Blackpool and Cottesmore, as well as air assault forces in Colchester and a specialised infantry group in Aldershot. Nia Griffith, shadow defence secretary, said Labour recognised there was "a need to modernise" the defence estate, but wanted reassurance families would be taken care of. She said: "The government is right to seek to restructure the estate to ensure that we optimise our military capability and deliver value for money for the British taxpayer. "The changes proposed in this report are very considerable in scale and there is a real need to ensure they are delivered in a way that does not cause undue challenges to our forces and their families." Ms Griffith also asked Sir Michael to confirm that all of the money raised would go back into defence and not into the Treasury. In reply, he said: "All of the receipts, not some of them but all of the receipts, will come back in to the defence budget." But unions have said the cuts will severely hit the support for armed forces and damage morale. Mark Serwotka, general secretary for the Public and Commercial Services union, said: "We are opposed to these closure plans that throw the future into doubt for thousands of staff. "The MoD has a poor track record on selling off land for homes and this again exposes how the Tories are simply paying lip service to the urgent need to address the housing crisis." Mike McCartney, national officer for Unite, echoed the criticism, calling the closures "brutal". "In many instances the bases earmarked for closure are at the heart of their local communities providing a source of decent and secure employment," he said.